A REIT (Real Estate Investment Trust) is a corporation that invests in real estate directly, either through properties or mortgages, and which is sold as a security. REITs typically raise 1-2 billion dollars in capital and purchase a portfolio of properties over a period of several years with the intention that these properties produce rental income. A REIT must abide by specific rules and restrictions so that it is not required to pay corporate income taxes, specifically it must distribute at least 90 percent of its taxable income to shareholders annually in the form of dividends. As a result, all dividend distributions made by the REIT to its investors are taxed only at the investor level, thereby avoiding any double taxation. REITs can either be offered as private placement investments to accredited investors, or publicly traded. 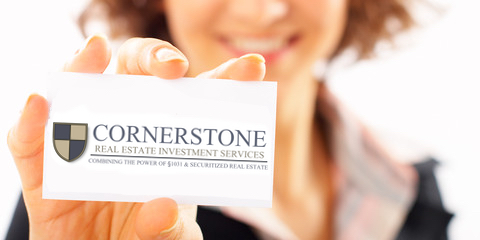 The offerings through Cornerstone are private placement investments which should be considered illiquid investments. Typically the goal of these REITs is to be offered publicly through an initial public offering or to be purchased entirely by a larger REIT, but these outcomes cannot be predicted with certainty and depend upon the performance of the particular properties in the REIT as well as trends in the real estate market as a whole. Equity REITs invest in and own properties and are measured by the equity or value of their real estate assets. Their revenues come principally from their properties' rents. Mortgage REITs deal in investment and ownership of property mortgages. These REITs loan money for mortgages to owners of real estate, or purchase existing mortgages or mortgage-backed securities. Their revenues are generated primarily by the interest that they earn on the mortgage loans.